If hearing today’s incoming freshman were born in 1996 doesn’t make your jaw drop, the University of South Carolina Transitions app might. Transitions is like a textbook to the 10th power (which, if you took math in college, you know is much better than a regular textbook). In case you haven’t already downloaded Transitions free from the iTunes store we’ll give you a bit of backstory. University of South Carolina offers a course dedicated to helping students get the most of their college experience. The award-winning University 101 course has a special textbook, and the next evolution of that textbook is the Transitions app. The app, created on the mag+ platform, doesn’t stop at standard text and pictures. It features interactive HTML5 elements like assignments that can be emailed back to professors, time logs that are graphed against fellow classmates and more. There are even links to the web directing students to live content like the most up to date information about their advisors, or links that allow them to sign up for the next available tutoring session. They can do all of this without ever leaving the app! Transitions also boasts an in-app scheduler that immediately exports this year’s sports schedules straight to the calendar of your choice. I’ve never even been to South Carolina, but I was so excited about this feature that I’m ecstatic to get Google Calendar alerts every time the Gamecocks take the court. A couple other great features include the ability to book study rooms and a ‘Things You Should Do in College’ bucket list. This interactive list creates a kind of icebreaker amongst the other more serious content about social wellness and methods for duping procrastination. If you’re one of those grownups who still cherishes your college years you’re excused from reading the rest of this article. Download Transitions now and start checking off those oh-so-satisfying boxes that reflect the fact that you lived college right. For people that are fascinated with mobile communication, it’s easy to see how features like time logs, email forms and interactive checklists could revolutionize workflows. The University of South Carolina also loves the advantages of having the most up to date information in everyone’s hands all the time. It wasn’t long ago that most everyone looked at tablets square in the face and swore they’d never abandon the feel of the printed book. Then kids started mistaking all screens for touch screens and swiping their hands across televisions. They tried pinching and zooming magazine pages. The world has changed a lot since 1996. It’s changed a lot since iPads and iPhones were introduced. 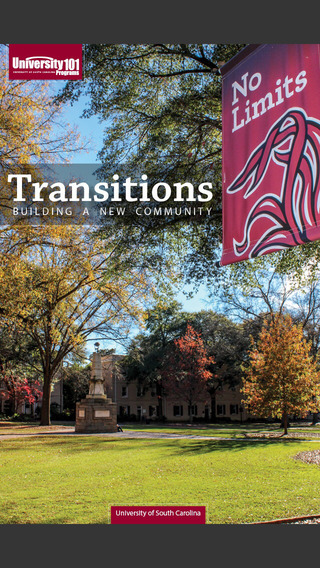 Mobile is everywhere and the University of South Carolina is capitalizing on the shift. If you can’t trust the kids to tell you what’s up, trust higher education.